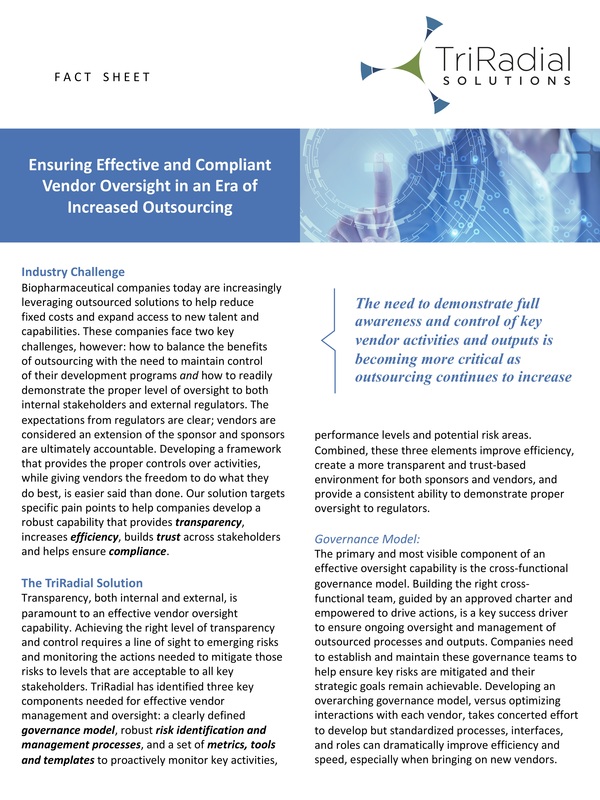 The need to maintain and demonstrate oversight of vendor activities has grown increasingly important over the past several years as the trend toward outsourcing continues to expand. Health Authorities have also shown a heightened level of scrutiny when it comes to vendor oversight. In order to maintain a state of control over your strategic goals and operations, you need full transparency to all critical path activities, including those performed by your vendors. Effective oversight can be a careful balance, however, between maintaining control and letting vendors do what they do best. At TriRadial, we help you develop a collaborative model, powered by metrics, to drive clear line of sight to emerging risks and the actions needed to mitigate those risks, while reducing unnecessarily overlap across stakeholders. We take a holistic approach to vendor oversight, developing the people, process and technology solutions needed to create a comprehensive vendor oversight capability. When the question is asked, “How prepared are we to meet our objectives?”, our approach provides confidence to all stakeholders, both internal and external, that the organization is ahead of potential problems and the right actions are being taken to ensure success.